Past the halfway point of the season now, NHL Central Scouting has updated their rankings for 2019. 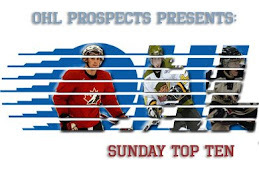 Here's a look at how the OHL players fared. A total of 51 were ranked. And of course, if you wanted to compare, here's my midseason top 50. Also, see below for my thoughts on the list. If you're curious to see the full list, you can find it here. 2. Just to discuss a few of the discrepancies further. I am baffled by the ranking of Mitchell Brewer. I think it's ludicrous. They've got Lev Starikov ranked at 121, 80+ spots ahead of him, and he's not even in the OHL anymore because his team felt that he wasn't good enough. Yet, Brewer is playing a key defensive role on one of the top teams in the OHL, has size, mobility, and he's that much lower? Additionally, how is there that much separation between Vukojevic, Okhotyuk, and Brewer? They're similar prospects with similar pro potential. This one just floors me. 3. Not that shocked to see Navrin Mutter ranked so highly. I had mentioned in my top 50 ranking that I was a fan, even if I'm not prepared to rank him as highly as CSS did. He's an NHL Central Scouting kind of player, as they still put a ton of value on size and truculence, more than NHL scouts do IMO. 4. The big shock was seeing Maxim Golod at 16th among OHL players. That came out of left field for me. He's ranked ahead of some pretty talented players that are out producing him. And they are in their first years of eligibility. Don't get me wrong, Golod has improved from his draft year and he was young for the draft last year. I think he deserves to be ranked and I like him as a later round re-entry candidate this year. But, certainly not that high. 5. Great to see someone else share in the Jacob LeGuerrier love. This kid is a great young defender and is only getting better. Wouldn't shock me if he was in the top 40 on this list come the end of the year. 6. Outside of the guys listed above, NHL Central Scouting's order is pretty similar to mine. Obviously I'm going to suggest that guys like Tomasino and McMichael should be higher overall in North America's list as I see them as potential top 20 candidates for June. But I also know that the scouting community is down on the OHL this year as a whole and that was obviously going to be reflected in a ranking such as this. Harvil Foosball Table Reviewed | Portable & Great For Kids! Does Mitch Marner score 25 this year? Future Considerations - The home of hockey tomorrow – today! Brock Otten is a former writer for Hockeysfuture and current scout/writer for McKeens Hockey. He has also contributed to many other publications over the ten year+ run of OHL Prospects. Capable of More/Is a Change of Scenery Needed?